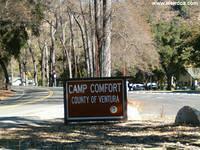 Just south of Ojai in Ventura County, along Creek Road is Camp Comfort County Park. Although the park looks peaceful enough, it certainly houses its share of spooky spirits. First is the ghost of a bride, complete with a bloody wedding dress. She is tall and slim, with light brown hair and a veil covering her face. The story tells that she was murdered on the day of her wedding, perhaps by a greedy new husband who married her only for her dowry. She has supposedly been seen with thumb out stretched, trying to hitch hike. Second is a spectral horsewoman that re-enacts her death every year on its anniversary. The horse gets spooked by a snake, subsequently throwing her off to her demise. Next up is a headless motorcyclist that can be found rocketing down the lonely road. The story goes that he was forced off the road by a pick up truck and was decapitated by either a wire fence or the branch of a tree. There is also the spirit of an old Indian shaman sporting feathers in his hair. Finally, the area hides the skeleton of a European Vampire who lies staked inside a stone coffin guarded by a huge black phantom dog. And in addition to the previous five spirits, determined ghost hunters can find even more spooks just north of the park on Creek Road near the two lane concrete bridge spanning San Antonio Creek. First there are two young children dressed in 19th Century style clothes. They walk along the rails of the bridge and finally jump off to plummet to the creek bed below. If you race to the railing, their forms will not be found on the other side. Next up is a dis-embodied child-like hand that runs along the railings of the bridge. Then there is a ghostly school bus which as local legend would have it, went off the bridge in the 30s or 40s. Twelve children and the bus driver died in the accident. The legend goes on to state that if you visit the bridge on rainy nights, you can hear the screams of the victims. However, even with all these spirits and spooks, the most famous of the inhabitants is Char Man. 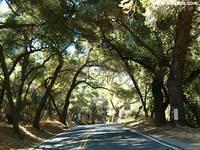 According to urban legend, a vampire relocated to the Ojai area around 1890 from either Italy or Spain. He acquired a small ranch and kept a low profile. However, as soon as he arrived, local cattle began turning up dead and drained of blood. Shortly thereafter locals were assaulted by strange wolf like creatures. The townsfolk got up in arms and realizing that a vampire was in their midst, raided the vampire's ranch during the day. But the vampire was prepared for that and had a huge black phantom dog guard his stone sarcophagus. It also drank blood. The ranchers eventually repelled the dog with a silver crucifix and closed in on the vampire's above ground stone tomb hidden by underbrush and weeds. Realizing, its master was in trouble, the black beast charged the ranchers again, only to be turned away as they sprinkled holy water at the hell beast. With the dog retreating, the ranchers opened the stone casket and staked the evil monster that lay within, thus ending the vampire's short reign of terror. The casket or stone sarcophagus is said to still lie there, hidden away amongst the brush and weeds. It is an above ground tomb with a small window in it. You supposedly can peer in through the window and still see the skull of the vampire. It has been speculated that this legend cropped up from a possible real life above ground tomb. It is plausible that an old family near the turn of the century could have buried their dead in this manner upon their estate. It is not only not unheard of, but also apparently the custom at the time in certain parts of Europe. Even the window in the stone coffin isn't completely unheard of. Stating that, however, if you are wandering around Camp Comfort County Park and come upon a stone sarcophagus with a skeleton inside, don't pull out the wooden stake. Here, near the bridge, the ghost of Char Man, a hideous burnt beyond recognition spirit, emerges out of the forest and attacks motorists, especially those brave enough to get out of their cars and yell from the bridge. So popular is his legend in the area, that the bridge has been dubbed "Char-Man Bridge". Possibly a ghost, possibly a hideous monster, Char Man, is no longer the man he once was. Now horribly charred, he is rumored to be covered in black burnt peeling skin, wearing little more than charred bandages and supposedly emits a disgusting burnt smell. He use to haunt Signal Street and Shelf Road, but as those areas became more and more populated, the legend migrated to the lesser inhabited area on Creek Road. Part of the story involves stopping your car on the bridge, getting out and yelling "Help Me! Help Me!" to which an incensed Char Man will come rampaging out of the forest and attack you. As with all good legends, there are three different yet similar origins. The first and second both occur in the fire of 1948. In the first story, a father and son are caught in the fire. Both are horribly burned beyond recognition, the father sadly passing away before help could arrive, the son mean while goes insane from his injuries. By the time rescue workers arrive, the son has skinned the father of all the burnt flesh and hung his lifeless remains from a nearby tree. The son, of course, eventually escapes into the woods and becomes the Char Man. 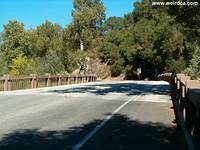 Ojai has a ghostly bride, covered in blood, attempting to hitch hike down Creek Road. In the second story, a husband and wife are caught in the fire. The husband, horribly burned and injured, hears his wife trapped by the blaze yelling "Help me" over and over again. The husband due to the fire and his own injuries is unable to come to the aid of his wife and lies unable to move listening to her pleas for help as she is slowly consumed by the flames. Again the husband eventually becomes the Char Man. Supposedly the Ventura County Historical Museum claims that there were no victims in the fire in 1948, so these two origins already appear to have some flaws. There's yet another similar version floating around that states that Char Man was specifically a fire fighter who lost his life fighting the same blaze. Finally a last theory takes place in the early fifties. It relates a story of a bad automobile fire (some versions place the automobile accident actually on the Char Man Bridge) in which the driver is hideously burned beyond recognition, but manages to barely survive, escaping into the nearby woods to become the Char Man. Some police officers claim yet another origin. In the sixties there was supposedly an elderly man who had a very bad case of skin cancer. His face and arm were badly disfigured and deformed. As he didn't like to be seen, he often took his dog for walks in the evening or late at night. During these strolls, he would occasionally be seen by local youth, who frightened, began propagating the Char Man stories. To muddle the tales even more, additionally later, there may even have been a Char Man hoax performed, which adds even more speculation on veracity of the entire Char Man legend. 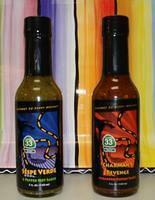 Char Man is such a famous local legend that there's even a hot sauce named after him. 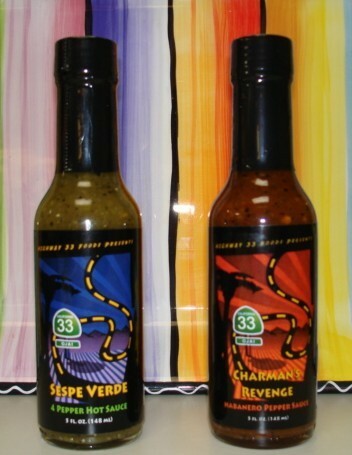 Created by Chris Sutton, Charman's Revenge Habanero Pepper Sauce is made by Highway 33 Foods and comes with the tagline "Just beware, with five fire-roasted Habanero Peppers in every bottle, Charman's Revenge may become a reality." So is the Char Man an elderly cancer case? Was he an elaborate hoax? Is he a monster or the ghost of a victim in the 1948 fire? Whatever, he is, the legend of the Char Man has now taken on a life of its own and just to be on the safe side, perhaps you should avoid stopping your car on the bridge along Creek Road. Many of the bridges on Creek Rd. Washed out during the 69 floods. All the trails in the creek were washed out. Mistletoe Meadows was gone never to be rebuilt. 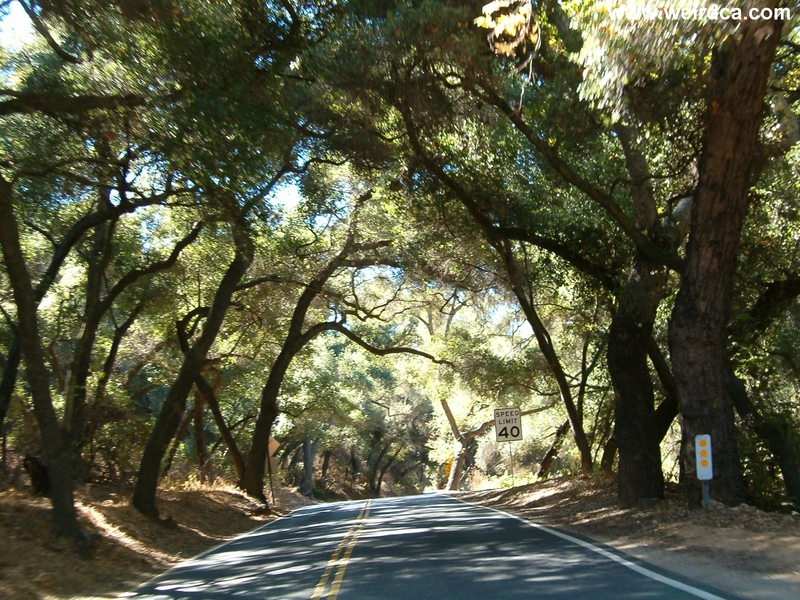 Most kids who grew up in Ojai roamed the valley, on foot, horseback or on bikes. I never felt unsafe. Going to the bridge and screaming for Char Man was just part of a great childhood. I was born and raised in Ojai. My husband on Creek Rd. We all grew up with Char Man but I have never heard the other stories. I grew up on the corner of Country Club Dr and Creek Rd. We had some weird things happen at that house. My sister and I heard screams of "help me" a couple of times also but it sounded like it was right outside our window. I have heard of the motorcycle legend of the headless motorcyclist creepy!! I spent 25 summers at Camp Ramah in Ojai. When I was younger, our counselors used to tell us the story of "Sharman", who lived in a nearby cave. Every summer we would hike up to Sharman's Cave and tell ghost stories. There would always be a counselor in another bunk who would hide and then scare us at the end of the story. In later years, when I became a counselor, I took pieces from the Sharman story and juxtaposed them with pieces from the Charman story. Eventually it turned into the ghost story to beat all ghost stories. I would telll the story to several bunks every summer. But ultimately I was banned from telling it after a group of 15-16 year old boys were terrified. I then started writing the book about Charman. I got through about 50 pages or so, but never got beyond that. My friend and I heard about the supposed vampire in Camp Comfort. It was the middle of summer with nothing to do so we decided to check it out. Before we left we stopped by my house and I put my necklace on with a cross on it. I gave my friend a cross necklace since I thought it would be some sort of protection. (I grew up in a religious family) We got to Camp Comfort and walked around. My friend walked faster than me and while I was trying to catch up we got separated. I got to the road and started running. I yelled her name but no reply. I said a prayer while holding the necklace when I heard growling. Then I saw something it was the same size and color of a black bear but black bears don't live in Camp Comfort. I ran and found my friend at the parking lot. I told what happened and we haven't told anyone. I just couldn't handle keeping this shocking secret so that's why I'm posting this comment. I'm still not scared of going back there. I want to know what that thing was. 20 years ago some friends and I did several investigations on this road. We were all curious about the stories that are told. The first couple of times nothing happened. It wasn't until our third time there that we witnessed a strange man standing on the edge of the bridge. He was just staring directly at us as we had chosen to park a bit away from it. The really strange thing was was that he just vanished. There are other thingson that road to that will scare the living daylights out of you. Also...To Edward Bintz of Arizona...My babysitters lived at the gate house on Villa Nova going into Milner's ranch. I grew up running wild all over Milner's ranch! Havent heard that name in years. I grew up in Ojai In the late 70s early 80s. The legend of the "Charman" was very real to me. My horse was kept at a stable on Creek Rd. and every time we drove past that bridge it spooked me. I had not thought about it for many years until I stumbled upon this today! When I was In girl scouts, we used to go on camping trips to earn patches and stuff. Once, we were camping in that area and our troop leaders told us to go set up a trail. It was dark but we didn't think anything of it. We walked for probably about 15 minutes when we decided to turn around and go back the way we came. We began making our way back, we heard a really creepy moan, but kept going. A few seconds later, we heard it again, and saw a figure of a man off the side the trail. It was dark so we couldn't tell what he looked like, but the moaning was coming from his direction, so we took off running. We came back to that part of the trail a few moments later with the troop leaders. But there was nothing there. That was a few years ago, and until recently I boarded my horse at a facility on Creek Road. My brother liked to tell me the Charman story every time he drove me to ride my horse. I think he was trying to scare me, and if I were younger the story might have, but now it just intrigues me to no end. I remember my parents telling me about this guy when I was a kid. It intriqued me everytime they told me and I always wanted to go out. Kathryn R. Bonneau - I lived at Camp Comfort for a while with my parents and was really good friends with a girl that lived across the street, but I believe her name was Hannah, but I do remember playing with 2 girls and we'd all get together and cause a lot of havoc. I was once driving through ventura city when suddenly i was aroused by a headless motorcycle bandit. He was armed with massive muscles, also wearing a sons of anarchy sweratshirt. by the way, he was charred. I believe that, that fateful day in Ventura City I saw Char Man. People may think this is a false statement, but I am a Harvard educated Lawyer. My wife and i went to the mission to get baptism supplies at the store there. On my way back to the parking lot, there were Balls flying over the wall like torpedoes.The balls were hitting cars and bouncing off them. The noise startled us. There were at least five different balls that came over the center of the wall. I kicked this foursquare ball over the wall that was at least 20 feet tall. Then jumped in my truck and unlocked the door for my wife. As soon as she jumped in I backed out and started to head towards the exit. I said kids kicking the balls over. The Ball I kicked over came flying over the center of the wall and went bong. As my wife and I exited the parking lot the ball I kick over the wall came back kept rolling toward the exit too. I felt the ball was rolling back to keep us in. As i drove out of the parking lot. I went around the ball,and exit right on Mainstreet. Right next to the parking look is an archaeological site. The site was gated off for construction up grades. So it was closed to the public. The site was huge, There was no way somebody could have kick the balls over and left the site before i turned the corner. The field was to big,and the balls came from the center of the wall. The balls that came over the wall did not come from the left or right because the ball would have came at an angle. My wife and I saw this man bouncing one of the balls with two of his kids right in front of site on the sidewalk. There was no way that the man could have kicked that many of the balls over and jumped over a fence to play ball with his kids.There was no one in the field.That was the amazing part. My wife and I looked at each other like did that really happened! That archaeological site is haunted for sure thinking about it gives me the creeps. I lived in the 1300 saratoga apartments in ventura called peppertree. I used to go outside on the balcony and draw pictures. one day i went out side with my notebook and colorpencils to look up and catch a glimpse of a burnt to crisp man. i look up to see a better look at him and he was gone. It's weird that i see your website cuz i was lookin into the history of saratoga to see if someone got burned in a fire. I beleve i seen the charman. I remember the stories all to well, my dad told them to me when he was the manager of camp comfort. we lived and managed camp comfort from 1980 to 1996. Most of my childhood memories are there. dad would tell the story of the char man to kids camping so they wouldnt play with matches or he say if children played with matches the char man would come and take them away from their parents and family.. and as children we beleaved it. i grew up most of my life there. playing in the hills and along the creek. Those memories have stuck with me for so many years. One day i hope to return. Untill then i have all the memories. And by the way my dads name was Raymond E. Bonneau, we lived and managed the campground and lived in the house across the street for 15 years and off and on over the years. I havent been back since 1996. Im sure alot has changed since those times of making forts in the hills and swimming in the creeks we damed up. But as a kids you couldn't ask for a better place to be raised, not to mention so many interesting people we met...Like i said one day ill return but untill then i wil hold tight to all the wonderful memories. It's so good to see my old home. My father was the ranger at Camp comfort park from 1969- 1978 I spent many, many days and night out roaming all over the hills clear up to Dennison park, Lions canyon, and up to old Milner's place, and Villa nova. Never once did I see any ghosts too bad. The original bridges were removed in about 1976. They were cool, the green arch ways loved to walk across the tops of them.